BEAT THE CROWDS - enjoy the rides 30 minutes before the park opens with FREE Early Park Admission - valid for entries until 23rd May 2019 (subject to availability, cancellation and change). Off-Peak Any Day Tickets are perfect for visits during off-peak dates as you are not restricted to the date chosen at the time of booking. Tickets are open-dated giving you the flexibility to visit any time 5 January-26 June 2019, 20 August-13 December 2019, 4 January - 31 March 2020. Date specific tickets must be purchased for visit during 27 June-18 August 2019 and 14 December 2019-03 January 2020 and are the only way to guarantee admission and express ride access during the Summer and Christmas holidays. Universal Express™ Off-Peak Any Day Tickets are open-dated and can be used on any off-peak date throughout the year, so you are not restricted to the date chosen at the time of booking. Valid dates are 5 January-26 June 2019, 19 August-13 December 2019, 6 January-31 March 2020. Universal Express™ Date Specific Tickets must be purchased for peak visit dates including the Summer and Christmas Holidays. Pre-booking a date specific Universal Express™ is the only way to guarantee getting front of line ride access on the following dates: 27 June-18 August 2019 and 14 December 2019-3 January 2020. Tickets must be used on the date selected. Off-Peak Any Day Tickets are open-dated and can be activated on ANY of the following off-peak dates: 5 January-28 June 2019, 19 August-13 December 2019, 6 January-31 March 2020.. Any Day Tickets Tickets are not valid for use 1-4 January 2019, 27 June-18 August, 14 December 2019-3 January 2020. Date Specific tickets must be purchased for visits 1-4 January 2019, 27 June-18 August, 20 December 2019-31March 2020. 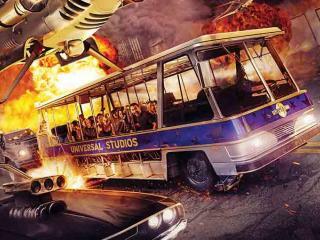 You MUST visit Universal Studios Hollywood on the date selected.